As November comes to close, we will have been on the road for seven months. Our self-appointed residencies in Sikkim and in Nepal now behind us, our touring-Asia-with-dialogue project has hit a milestone of sort. In these two-step-forward, one-step-back processes of moving around, figuring out as we go what we do, and what we share, we’ve become more aware and clear about what we are doing. The process has also nurtured us, and taught us to be, as a team and individuals. Of course, we are still groping in the dark. Why are we doing what we are doing? how does it matter to people who care, the rest of the world, and the communities we visit? There have been signposts, however faint and shrouded in the low light, along the way. As I mentioned in my wrap post for Modern Sikkim, the connections and friendship we are making, I feel, are one of the bigger ones pointing us to the next steps. 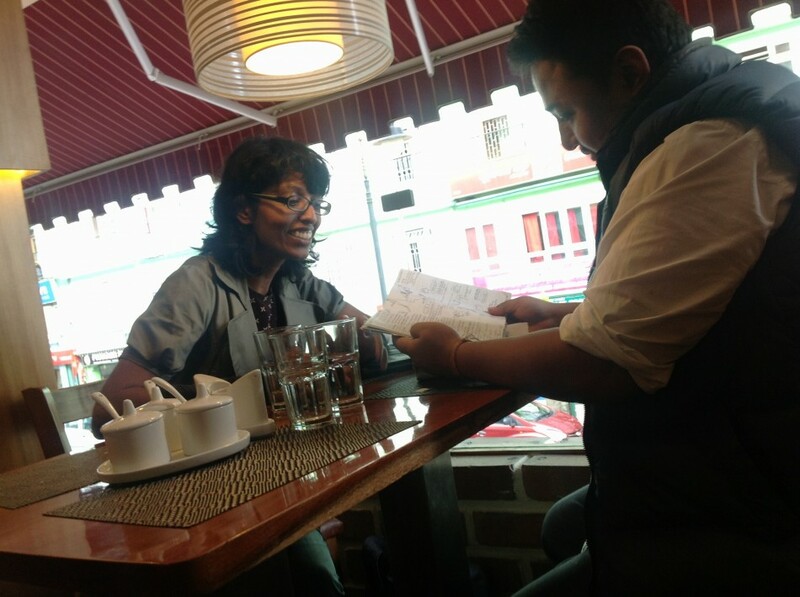 For the Sikkim project, we had a number of casual talks leading up to the actual event. We gathered groups in three different venues in preparation for the big conversation event, and had countless more chats with close to 100 people, practically every time we visited offices and shops with our ideas, either to invite them, to get permissions for something, or to explain ourselves. 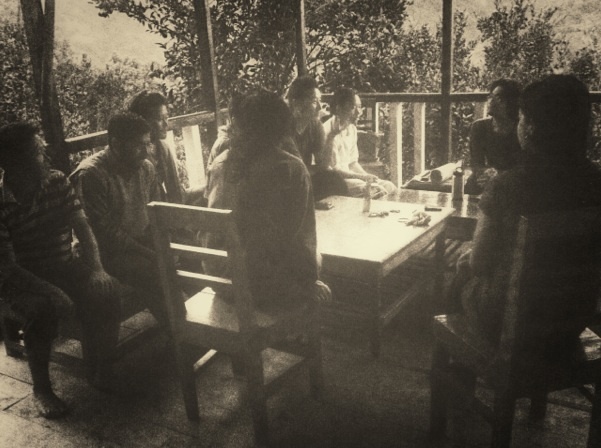 In Nepal, too, there were a lot of small conversations that led to the formal gathering we had around the idea of coworking. We also had lots of side threads going many different directions: travels, photography, art, politics and history (! )—more led to just friendship, and possibilities of future collaboration than actual “project” in our limited time there, but again, we’ve learned to let ideas be and the relationship to take its time building. Since we know practically no one, and we make no formal plans before we leave, we have to keep intruding people in their days and routines to insist our ways in. We barged into an office of NGO that we’d never heard of before simply because one of us thought its building appealing; we popped into a newspaper office to announce our presence and our intent to “meet someone interesting.” And what a blessing it has been—everyone opened their door to let us in, gave us a round of chai, and invited us to talk, and gave us stories of their own. Many have opened up to us—about their frustrations with the government and corruption; their growing up and identity; and their personal hopes and dreams for the future. One person told me a personal story: a life at an orphanage in Manipur, then a scholarship education in Kolkata, coming to Sikkim with a hope for an opportunity, and ended up staying despite it not working out. He said “I want to do something still, you know? Something that matters to me.” He’s working on his film project, documenting Himalayan Yaks and the life of their herders. “Dev” opened his door and talked to us, just as we were doubting ourselves. Another, Tenzing Wangdak Lama, now an internationally-known Thangka painter , told me a similar story of great suffering, hard-earned opportunity and grit over ice coffee and cookies. 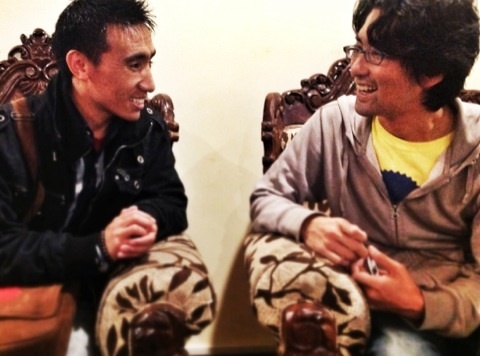 He told me that his dream was to establish a Tibetan arts and language learning center in Sikkim or Bhutan, to spread his love for the art form that gave him his life purpose. In Nepal, we met Sattya Media Arts Collective, a brave bunch advocating for more creativity and more individual expressions, their wide spectrum of supporters. In our joint event to talk about coworking, the importance of community, and the difficulty of nurturing it, was a major theme. All along our path, we met entrepreneurs, international activists, families and couples of different backgrounds and cultures. One time, an unlikely chance encounter followed by another one led to our being invited to a posh rooftop parties where artists, trekkers, business people and guesthouse owners mingled as if they were in Manhattan. We left buzzed, dazzled and somewhat confused that such a thing can exist not a block away from our dinky 600Rs-a-night guesthouse (whose founding, we learned within days of this party, had to do with a Japanese government worker, his meeting a friend of a lifetime in Nepal on a official trip 18 years ago, and a $100,000 investment out of his pocket to start an NGO of their mutual passion.) We also met and befriended many travelers crossing our path, mostly from Japan (our joint heritage and affinity towards Japanese culture and language might have something to do with it), and through these connections, had a chance to visit a “Japanese guesthouse” in Pokhara. We found a genuine community there—people bonded by their experiences, sharing of stories, and the common aspirations for travel. Kush even learned to say “this way,” “where’s that?” and “amazing!” in Japanese through these conversations. Along the way, we realized that every interaction was a conversation, a chance to have real dialogue, and share a connection. Our task was to bring the awareness and openness we try to bring to our events to each of these interactions. Be present as much as we could, and receive their presence as gift. Try and resist interrupting, correcting or otherwise directing the conversation to our liking. Listen fully, and encourage exploration by saying yes more than no. And during the last 28 weeks, helped by the people we encountered, with their natural inclination toward openness and respect, we were more successful at making these dialogues than ever in our lives. 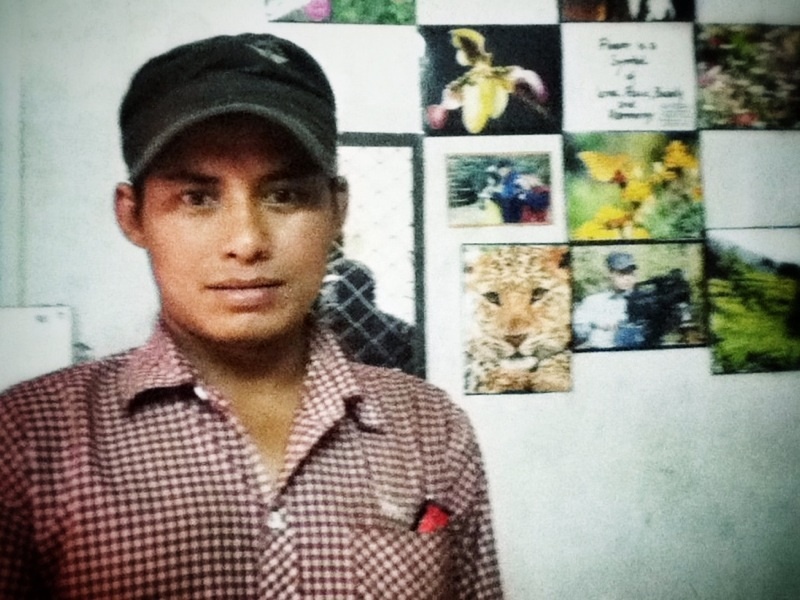 We listened together to personal stories of loss, frustration, triumphs and dreams. We thought together, and came up with new insights. At the Coffee Shop, a popular wifi-enabled hangout on MG Marg. Development happens, in all aspiring civilizations. And both Machiavellian “each to his own” opinions, and its opposite “let’s see what you have to give me” attitudes, abounds. A newspaper editor, when asked about rather high suicide rate in Sikkim, quipped: “people always have a choice.” In a quiet, beautiful resort village of Nagarkot, a group of local girls, no doubt accustomed to wealthy visitors showering them with gifts and money, chased us with a chorus of “chocolate, chocolate!” No one escapes the claws of modernization, and its attendant disconnect and alienation from each other. Even if, like in Sikkim and Nepal, old values seem to be present still, and modernization in its literal sense (infrastructure, technology, development and wealth) seems still out of reach for many, and in-progress at best. What is beyond the obvious surface, of “progress”—the new roads, better grids or water and waste management systems, “home stay” facilities for the tourists, development of the urban centers, better hospitals and airports, smart phones and Internet for all—are people, individuals all, struggling to find his or her identity and meaning, just like the rest of us. What do we want, really? The hints are all around us, and we only have to pay attention, listen to each other. That’s my deeply felt conviction, and many, after having talked and being listened, expressed a sense of catharsis and hope to us. What’s coming Next (in a grand, tech-historic way), in our opinion (by using the “we” pronoun here, I include, with a slight bit of presumption, the people with whom I felt the connections in Gangtok, Kathmandu, Durham, Seattle, and beyond), is a new world order that’s based on our needs to make meanings, and to connect with each other, instead of materials and resources we amass to simulate these values. Where one-to-one relationships are the currency, and network of unordered connections move ideas forward. Picture a network, with each node as a person. We are connected to many who’re all connected to more. It’s a sprawling web, ever changing shapes and lighting up as ideas are transmitted from person to person. Many of us a already familiar with such a network. The Internet, aside from all the convenient ways to distract ourselves from our various tasks of the mundane “work,” has given us a perfect simile to the way people ought to connect to one another: one to one. This is happening in real time, everywhere, whether or not a place has “modernized” already, or not. Our communication technology, thankfully, doesn’t wait for paved roads, true democracy, urban planning, eradication of diseases or modern education. I believe in this picture, and that this shift to networked, idea-driven society will not only circumnavigate the problems of developing world but also _be_ the solution to these problems. I am convinced enough to put all my chips in for its eventual victory. And it’s not necessarily new: humans always longed to connect with each other, and used stories, tribal circles, town hall meetings to make these networks visible and sustainable, for centuries. It’s just that the “modern” (I mean, late 19th Century) cultures have distanced us from these traditions, but we are getting back to it via new, networked technologies. This new (old) “flat” world order espouses values such as openness, spontaneity, creativity, play, agility, flatness, interconnectedness, independence, abundance, creation and wholeness. On the other, crumbling, side is the modernism: the old hierarchy, with its closed-ness, permission-based order, proprietorship, mechanistic work as a sole means to earn a living, efficiency, and mass, standardized consumption. Our conversations, it turns out, are another, analog, simile to the way the world works according to this flat world, and a practical application of the theory that we can connect people through ideas. The connections between people we create through the conversations, if strengthened and extended regularly, will work as villages should: as a support, a source of abundant resources, and a mechanism to move our society forward. Let’s build this village. One conversation at a time. I’d love to hear your thoughts. Very compelled to write today and connect with you. I am here in Cary, NC and just read the amazing Orangutanswing page in Sathee magazine… and the journey started.. I had some vague memories of Design Kompany as I have been living in Triangle area for the last 17 years but never took a deep dive with you. I guess today was the day destined for that. I see the connection and like minds see that even more. 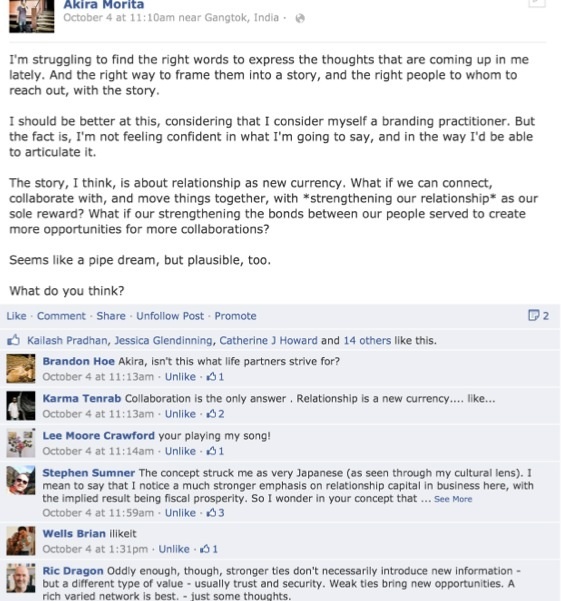 Connections -> conversations and collaboration all resonate with me and strike a chord. It’s kind of funny that my day job is at a company – a giant corporate (“the router company”) here in RTP that is leading with the collaboration technologies – wishing for more and more people ‘enabled’ with connections. I am so glad that we are connected as I would like to know more about your adventures and stories. Appreciate all the work and the wild streak you have. Hope you are having a wonderful time! If you are home in Triangle area, let’s connect more. Yes, let’s definitely connect more, in person or not. We are all ears to hear your ideas (as a technology person!) for fostering communities online, too. Reading this makes we want to be there in flesh and blood. However, I come to think about in what way your conversations and round tables still mirrors your own ideas. I mean, when a mother with its child come to a playground and meet another mother, they tend to end up talking about their children and issues with parenting, at least as a initial topic. Even if the same mother are not engaging with another parent, but only uses public transportation and happen to kill time while waiting for some form of transportation to come or to continue. For children this time and place, as any time and place, is play-time or start-a-conflict-with-my-parent-time. These events tend to provoke outsiders to connect, sometimes to complain or sometimes to join in, even those conversations end up talking about children and parenting to start with. Because the participant that joins are attracted and tuned into that spectrum of conversations, even to some extend expect it, through the invitation broadcasted in the public space. So what I am saying, through that you guys are introducing yourself to your new surrounding and present a topic, those that attract to that topic will engage. Nothing new in it perhaps. A guy, that never have sustained a longer love relationship, and never expect to take responsibility of a own child or children in general, that guy will never engage with the above mentioned mother if not to complain of the loudness a conflict or play may have. The thoughts that these people, “different” from us, will have, will we never learn about, if we wont participate in activities such people now engage themselves with and follow their agendas. I truly believe that the mankind have more things in common than we take credit for across cultures. But we tend to define things from what it is not, hence we focus on the differences instead of our common ground. So my point is, can we invite meetings with people and encourage them to talk without pre-screening them or pre-expose them to our own topics. Come to think about it, I think it is quite hard, how can we get the trust from a person, without give them something to build that trust on(?) to encourage them to take part in a meeting. That could be interesting, to work with trust. A wonderfully thoughtful and thought-provoking commentary. Thanks for sharing. My hope is always to create an open enough “space” for all to join in. Admittedly, there is always going to be the issue of pre/self-screening that happens depending on the topics, people already present, etc. However, the strength of our approach, I think, is that our being “outsiders” (without ties to existing political and other biases and associations) creates an atmosphere of being neutral, thus making it just a little bit easier for people who may not otherwise to engage with each other, through us.